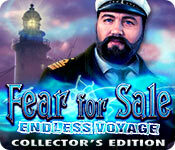 Fear for Sale: Endless Voyage Collector's Edition is rated 4.3 out of 5 by 47. Rated 5 out of 5 by tutortime from Loved it, worth the money. Loved the story line of this game. It was nice and long, great graphics and you got to find extra objects - morphing objects though out the game and bonus chapter. Rated 5 out of 5 by NamelessJoe from Great for Bubbas like Me ... Excellent. Some of the puzzles are really difficult and you have to go back and forth to find the clues you need. The only thing irritating is the Captain with little Personality. It a Great Game for Bubbas like me ... !!! Rated 5 out of 5 by mrm2006 from Sail into the ...... Past aboard the Virginia! I knew almost immediately upon playing the demo that this was going to be not only a great game but that I would have to add it to my growing list of unplayed games - lol. The storyline is a fairly new one. In the 1930's, 3 people went missing when the ship, named Virginia, disappeared while at dock. Imagine ..... a storm .... fog enveloping the ship .... lightning .... a fierce wind ..... and then .... the Virginia disappears right before your eyes! It's now "present day" and another ship, named the Virginia, has docked at the same pier. Is it a duplicate in every way, including the name .... or could it be .... the SAME ship ????? OH MY!!!! Shades of the Bermuda Triangle!!! There are 4 difficulty modes: Casual, Normal, Hard (each shows you things like sparkles are on or off, how often your hint button recharges, etc.) and Custom (where there are several options you can change to suit your game play). Graphics are sharp and very realistic. Even down to the numbers on the clock at the pier. The music was not creepy at all .... more ...... quite lovely. That's the best I can do. I would normally have listened to it throughout the game play but I had a terrible ear ache today and ultimately turned it off. That actually disappointed me. Voice overs were extremely well done. I had no problems either hearing or understanding the various characters. There is a transportable map which not only shows your current location and where something needs to be done ... but ... a BIG yellow star will appear indicating you have found all the morphing objects in that area. How cool is THAT! There is a task list .... and you can work your way UP the ladder of journalist ranks by finding 8 items throughout the game. The tutorial offers you the choice of "full tutorial", "only on Special Features", or "No tutorial". 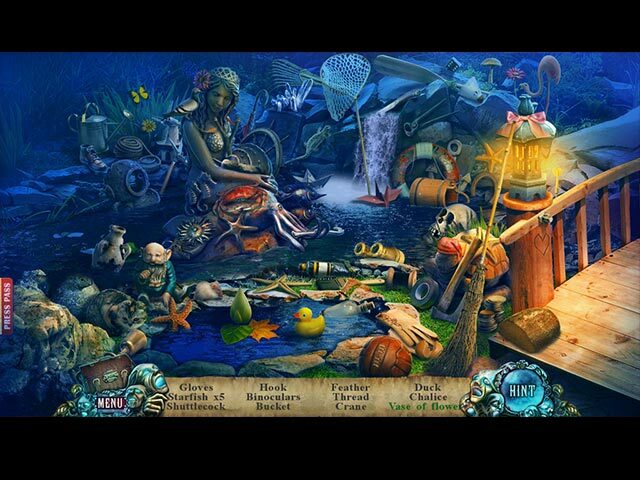 HOGS (hidden object games): 26 - extremely interactive and quite fun. Mini Games - 28 - I found them a variety of easy peasy to .... hmmm .... THIS is going to take some patience and perseverance (of which I have neither). lol CE Bling: Besides the customary Bonus Game, Strategy Guide, wallpaper, etc., there are the following: Collectibles --- 25 total ..... 5 items in each of 5 categories. Beyond Objects - 34 (another name for "morphing objects"?) I think those at any level of experience would enjoy this game as there is certainly NO shortage of things to do as you move through the game play. It is high in entertainment value but not so "busy" that it takes away from the story. I very rarely give a game 5 stars but when I do it's a guaranteed purchase for me. I was hooked very early into the demo. Join me in investigating the Virginia. Will we find answers or sail away to ..... the past? Enjoy! Rated 5 out of 5 by Cherubabies from I LOVE the "Fear for Sale" Series! Excellent in every respect! The Storyline kept me interested all the way - which most Games do not. 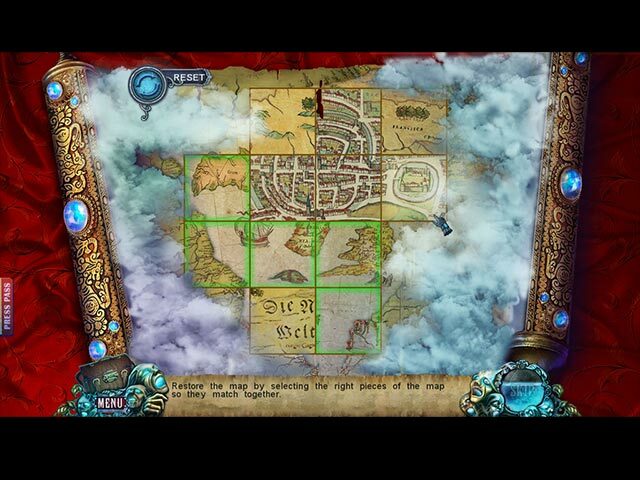 Any Game that offers Jigsaw as an option for Hidden Objects is a must-have for me! Haven't played such a good Game in a long time! LOVED IT, 5 Stars all the way! 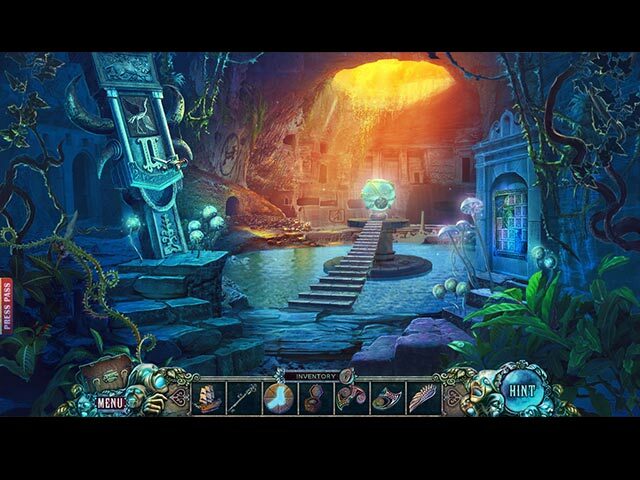 Rated 5 out of 5 by imaGamehawk from Best Hidden Object Game Morphing, morphing & more morphing. My kind of game! Rated 5 out of 5 by sgrwlf27 from Talk about endless fun!!! I have been playing big fish games for many years and have always relied heavily on the reviews. I felt bad recently that I seldom ever leave one and so decided to start making copious notes while playing (I play so many that sometimes I forget by the end each detail that deserves kudos or even critique) so I could start doing what some reviewers have done that led me to purchase a game after trying. So I'm not gonna be one of those reviewers who gives you game details (I'll leave that for those who do it so well). But I definitely want to shout out to the devs and other fishies just why this game is beyond anything I've played so far. First, the demo was 90 minutes and by the time it ended and I knew I had to buy, I feared I was over halfway through the game. NO WAY! Whew, I never saw the next part of the saga coming after investigating the murder. This storyline was so fantastic and I played for hours last night and all day today (since 8 am; it's now 5:30 pm) and just now finished main game and getting ready for the bonus game. Worth every cent here. The music was sooo relaxing. The voices were realistic in their roles. The picture quality/art? Let me say that after using the cannon in the ship cemetery, I was MESMERIZED by the ocean water. After backing out, I stepped back in just to view that amazing ocean view and it felt like I was, literally, on a beach watching the waves sparkle. The storyline was so involving and I especially loved the point system; kept earning major points for doing what we always do in HOAs. The puzzles were fantastic and I admit: I still consider myself only an intermediate because of puzzles. My logic is just not that great there, but I keep pushing myself to not skip them as they build logic as you keep playing them. If I have to have a start, I look at the guide and only view the 1st 2-3 steps of 15 or so and from there I can usually finish them. These were some tricky ones (probably why the game lasted so long for me) and full of fun. The entire game has me waiting with bated breath for this company's next release. I will point out that in the differences puzzle, 2 items were different that didn't count towards the 8 to find: black branch above and left of jack-o-lantern; above that a branch on the left hand side was missing from the right hand pic. The lower left hand branches differed from the right hand pic. Do NOT miss this game if you love a great storyline, calming music, atmospheric scenery, and engaging puzzles and hops. Rated 5 out of 5 by Darksparkss from Amazing And Fun It Good, Interesting, Fun, Good Quality, and Challenging! The Storyline is Fantastic as well as the Quality with a amazing texture. It just makes my energy back up when i am bored! It also Tricky sometimes even if it is just right infront of my eyes, I had waste up my hints just to find it. The puzzle it Challenging and sometime complicated also confusing, but fun at the same time.